Update 17 May 2009: The Volkside website has been redesigned since this post was written but the input prompt behaviour is still applied. Key function on any business website is the ability to contact the company. Several pages on the Volkside website lead you to the contact information page, and having prospective customers get in contact with us is indeed the main “call to action” on this site. The contact information page itself offers multiple ways of reaching us, one of the most obvious being the contact form (“Get in Touch”). 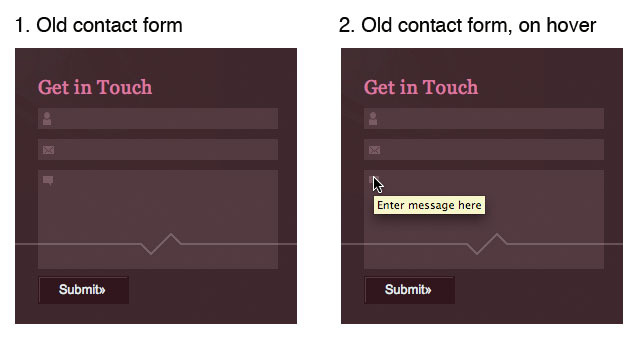 It is critical that the form works well, so I took a look at how to improve it. The good: The heading is task oriented and the form collects all necessary information. All form fields are mandatory but luckily there are only three of them. The bad: The icons next to each form field are small and low in contrast, so it’s difficult to tell which piece of information goes where. It is not obvious whether the fields are mandatory or not. The submit button label is ambiguous and it’s not completely clear what happens when the form is submitted. I also renamed the submit button to “Send message” to make it clear what happens when it’s clicked. Mandatory fields and form error handling may still cause issues, which is something to address in another post. 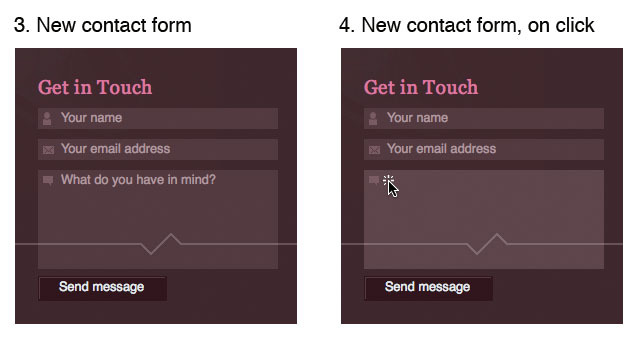 Try out the new version of the form on the contact information page. What do you think? Do these changes make sense? How could this form be improved further? all good, thanks for the feedback! I have implemented most of your suggestions, have a look at the contact information page and force page reload by hitting Ctrl+F5 (Internet Explorer on Windows), Ctrl+Shift+R (Firefox on Windows), Cmd+Shift+R (Firefox on Mac) or Cmd+R (Safari on Mac). I wonder if “” is better than “Your email address” etc? This clarifies that this text will be cleared upon clicking it, otherwise I think the text might be . I even wonder of “Your” can be left out, as the icons together with the text “email address” are quite self explanatory and a bit cleaner. After all these types of fields are now becoming more common and therefore I believe that there exists a common knowledge by web users that you input your own name (is it called semiotics or icons?). What do you think? I also think that there should be information regarding which fields are mandatory, since I got an error message when I did not fill in my email address and my comment was cleared when I returned to this page. This can be done by either writing “*mandatory field” in red or other warning color after failure to complete the form correctly and/or an “*” next to “Your email address” and “* mandatory field” at the bottom, especially so that people do not refrain from commenting due to the belief that the have to input a wab page even though they don’t have one. Also, it should be possible to correct ones misstakes, in other words, not lose the information like it currently is set up.